I have just returned to the Provost’s Office after an eight month leave. I thank Lorraine Davis for doing a great job in the role of Acting Senior Vice President and Provost. She left a stronger administration than she took over, in the face of some steep challenges. I want to discuss two points today: internal communications and priorities for the Provost’s Office. Internal Communications: I feel that during the last legislative session, due to our intensely political environment, our internal communications faltered. I commit to reversing that. Aria Seligmann, a communications professional working for the Sustainable Cities Initiative, has now committed part of her time to the Provost’s Office to help maintain a continuous flow of information to the UO community. I will provide regular updates on current events affecting the university, with data summaries of various successes and challenges facing the campus. I am reorganizing the Provost’s Office to free up time for visiting with faculty, staff and student groups across campus. Until next time, enjoy the summer that seems to have finally arrived. I am pleased to announce that Dr. Melissa Woo has accepted our offer as CIO and Vice-Provost for Information Services for the University of Oregon. Melissa currently serves in the role of director in University Information Technology Services at University of Wisconsin-Milwaukee (UWM). She has a BA from University of California, Berkeley, a PhD in biophysics from the University of Illinois at Urbana-Champaign, and extensive IS leadership experience at Illinois and UWM. She brings particular expertise in research computing. Melissa will be joining us September 3, 2012. Please join me in welcoming Melissa and thanking Roger Thompson and the search committee for bringing us such outstanding candidates. We’ve all got our pride I guess, but leaving the interim appointment business off of his vitae might be a bit problematic in some situations. No word on a date for his performance review – let me know if you hear anything. 7/1/2012: It’s no surprise that his website is wrong. Frohnmayer appointed him as *Interim* Provost in 2008, after Linda Brady left in a hurry. There was no search. Then, after he ran Lariviere’s transition team, Lariviere appointed him permanent VP and Provost in 2009. Again, there was no search. Nor has Bean ever had a performance review as interim Provost or Provost. Bean’s 2011 sabbatical plan talks about him “transitioning back to faculty”. Great – but when? Bean’s vision of UO’s future is perhaps best captured by his 2009 academic plan, which has been ignored by everyone including his own office. Acting Provost Lorraine Davis has spent the past year cleaning up his various messes. It’s a long list, but her most recent effort has been Information Services. 2 years ago CIO Don Harris had a performance review that turned up lots of problems. Bean did nothing. So, while Bean was out on sabbatical Davis fired Harris, restructured his office, and started an open, transparent search which has brought 3 candidates to campus over the past month. Maybe Gottfredson will keep Davis around, and have her run a similar search for a new Provost? The time line for transitions in the Provost office has been determined. Jim Bean will return as Senior Vice President and Provost beginning July 1, 2012. He will continue his sabbatical through May 31, 2012, and then serve in a transitional capacity during the month of June. This will permit appropriate planning and coordination with me, the Executive Leadership Team, and Bob Berdahl as well as an overlap period with the current and soon-to-be-appointed Senior Vice Provost for Academic Affairs. As the presidential search gets underway, it will be helpful to know who will serve as Provost on an ongoing basis. I look forward to continuing in my current acting leadership role through the end of this academic and fiscal year. I appreciate the continuing support and assistance I have experienced. We’re all on a first name basis here, so who needs a job announcement, search, or a performance review? That sort of stuff is just for those faculty schlubs – the ones that Jim gets to evaluate and sign off on tenure and promotions, as provost. The month long overlap with Lorraine is so Jim can recover from his research efforts with old friends and get back up to speed on administrative matters. We hope to complete the review this week. Who pays for Lorraine Davis’s trip to the Rose Bowl? 12/28/2011: Not state appropriations – so student tuition? It’s all fungible anyway. I like that clause for spouse and dependent children. Our administrators are quite thorough when it comes to nailing down their perks. Go Ducks! Full contract here. She gets a free car, just like Bean – and a cell phone too. What fun! 9/24/2011: Word down at the faculty club is that one of Interim Provost Lorraine Davis’s first acts was to offer her longtime friend Frances Dyke a job as her special assistant – so she’ll stay on even after we get a real CFO. This is exactly what worried everyone about Lorraine’s appointment. 9/19/2011: The groans over this are as loud as the crowd at Matt Court on a bad night. Not exactly hope and change. I don’t know what to think. Will she get to keep her car? What will this mean for her golden parachute contract? The 2008 Oregonian story by Suzanne Pardington on the golden parachute deals is here, the Moseley, Williams and Davis contracts are here, today’s Bill Graves story here. Nice headline. Not a lot of options for UO. Provost takes an unusual combination of skills combined with a willingness to work in academia. The people who are good at this and enjoy it have jobs. She did keep Frohnmayer and Moseley from destroying UO. I hope we get a replacement for Frances Dyke real quick. Comments? This afternoon I am making the following public announcement regarding the appointment of Lorraine Davis as acting provost. I want to share the news at this time with the UO community and its partners. During Lorraine’s interim appointment, Vice President for Research & Innovation Kimberly Espy will report directly to my office. All other administrative alignments will be unchanged. I hope you will join me in welcoming Lorraine Davis to her newest role at the UO. Versatile administrator Lorraine Davis has been appointed by University of Oregon President Richard Lariviere to serve as acting provost at the UO for next year. She will fill in for Senior Vice President and Provost James Bean, who has been granted a one-year sabbatical during his recovery from a pulmonary embolism he suffered in June. Davis, whose appointment is effective Oct. 1, is a retired administrator and faculty member who currently serves part-time as a special assistant to the president, provost and athletics director. She was appointed interim athletics director in March 2010, replacing Mike Bellotti, and served until Rob Mullens was hired and took over the permanent position four months later. Davis, who previously held the position of vice president for academic affairs, said Monday that she is honored to serve the university and to assist during Bean’s recovery. She expects a learning curve as she gets fully up to speed on current academic issues, but intends to maintain what she described as the “upward trajectory” of the institution. Davis joined the UO faculty in 1972 and served 20 years as a professor in the College of Human Development and Performance, teaching graduate research and statistics. She became graduate coordinator and department head in the UO school and community health program, then was appointed vice provost for academic personnel in 1990. Davis served as vice president for academic affairs from 2001 to 2006, with the deans of all UO schools and colleges reporting to her. She earned her doctorate from the UO in health education, and holds bachelor’s and master’s degrees in mathematics and health and physical education from the University of Wisconsin-La Crosse. Bean, who has served as UO provost for the past three years, announced a week and a half ago that he will return to teaching and research during a 60 percent sabbatical appointment over the coming year. Update: Rachel Bachman has more on the why. Predicts Jamie Moffitt will get promoted. 7/21/2011: From Adam Jude in the RG. Ms Baumgartner was Kilkenny’s hatchet woman when it came to cutting wrestling, she’s now giving up her $156,814 job at UO for Syracuse. My guess is that AD Rob Mullens uses this as an opportunity to add another perk to Lorraine Davis’s golden parachute retirement contract. The Oregonian wrote about this scam long ago – the contracts were one of my first public records requests. I thought Ms Davis was long retired too, until I saw her at a Jock Box meeting a few months back and spit my coffee all over my shirt. Turns out she’s now a Professor Emerita of Educational Methodology, Policy, and Leadership. Her other titles include Special Assistant to the Provost and Special Assistant to the AD. Very special – she gets $197,278 at 0.62 FTE, plus a cell phone and a car allowance, tickets, and an unknown expense account for travel to those fun away games. What does she do for that money. Sure you want to turn over that rock? 6/2/2011: “Know the O” is the athletic department’s latest effort to pretend that they have some relationship to UO’s academic side. They are going to find a sponsor for 30 second spots on televised Ducks games, to highlight faculty research. Right in between the Bud Light commercials. My vote was that we sell the airtime to the highest bidder, and then use the money for research and scholarships. But apparently that airtime belongs to AD Rob Mullens, not to the University of Oregon. What else did I learn at the IAC? Lorraine Davis still has some athletic affiliation, and she is the go-to person if you are faculty looking for free tickets to a game. Not clear if you can take the tickets and sell them for cash to pay for time on the LCNI scanner – ask me when the football season starts. 1/20/2011: Steps down as interim AD, but kept the benefits, and a nice chunk of the $360,000 salary. I wonder what arrangement she and Rob Mullens have for this year? How long will this go on? Who is running UO? What does paying for her car and cell phone have to do with our mission? Meanwhile, here’s a story on what’s happening out there in the real world. Many UO staff are paid wages below the eligibility limit. 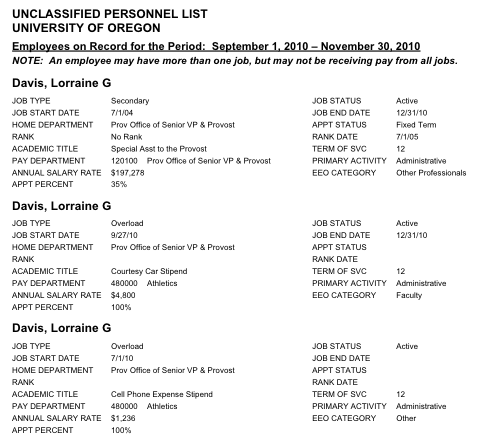 3/30/2010: Since 2006, Oregon’s new Interim AD, Lorraine Davis, has been getting paid half time at a $197,278 FTE out of a fund that was originally intended to support retiring tenured faculty while they taught classes for 5 years prior to complete retirement. When Provost John Moseley, and VP’s Davis and Dan Williams retired ~2006, Dave Frohnmayer set them all up with generous golden parachute contracts, paid from this fund. All of them are still on the books. Instead of requiring them to teach – as the program intended – Frohnmayer came up with administrative sinecures. Moseley is obviously the biggest offender. 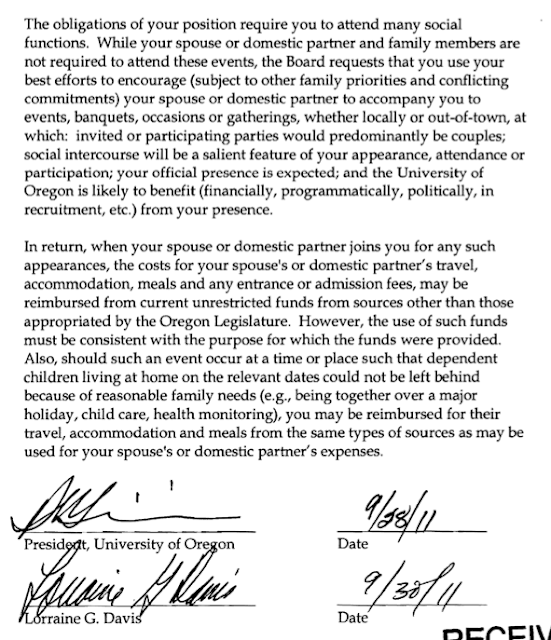 Despite an OUS audit about the situation, Lariviere has him on the books as “liaison UO to Central Oregon” (sic). We pay Moseley 1/2 time at a $248,941 FTE to liase from his fishing retreat on the Deschutes – you can rent one of his lodges here. We don’t know what Dan Williams is doing for his money. regional site for the next round. tournament. I’d like to plan as if they will do so. and have more information regarding travel. I wonder if $197,278 FTE is the going rate for proctoring exams? Don’t GTF’s earn $12,000? I wonder if we paid her travel expenses too? This is what they mean when they say the athletic department is financially self-supporting? Somehow I don’t think Interim AD Lorraine Davis is going to be spending a lot of time getting to the bottom of that question! I guess the good news is that after she starts collecting the $30,000 a month AD salary, these payments will go back toward real academic purposes – at least temporarily. leader at this important time for the Athletics Department.